The Pazzoâs/K.O. Eagle-Vail Holiday 5K/10K, part of the Pedal Power Snowshoe Adventure Series, takes place Saturday. 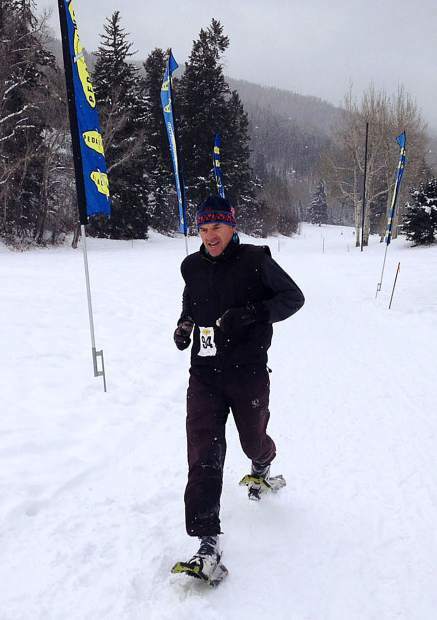 VAIL — The second race in Pedal Power Snowshoe Adventure Series, the Pazzo’s/K.O. Eagle-Vail Holiday 5K/10K, will take place Saturday at 10 a.m. Racers will meet prior to the start at the Eagle-Vail Pavilion located off of Highway 6 & 24 in Eagle-Vail, just west of Vail. The Pazzo’s snowshoe event takes place on a woodsy technical course with short steep ups and fast downs through the trees flanking the Eagle-Vail area. Racers can “kick it out” as they hit great open stretches on the flats. According to race organizer Bruce Kelly, it is consistently one of the most popular events of the series. Recent snows ensure optimal course conditions for this year’s race. Registration for this event is $20. Participants can save time by pre-registering directly online at pedalpowerbike.com. They can also register with forms from Pedal Power Bicycle Shop in Eagle-Vail or by calling 970 845-0931. Registration is also possible on the day of the event at the race start for $25. The next event in the Winter Race Series will be the Aria Athletic Club Winter Triathlon. That race will take place Jan. 21 at 10 a.m. at the CMC Timberline Campus in Leadville.